1. Buy extra copies of the newspaper and give them to friends or leave one at your local coffee house. We are proud of our journalism and want to make sure that people across our region read Street Roots. 2. Buy our holiday zine from your vendor. Our vendors worked hard all fall on this, and it is chock-full of insightful, compelling artwork and writing. It’s full of color and beautiful. 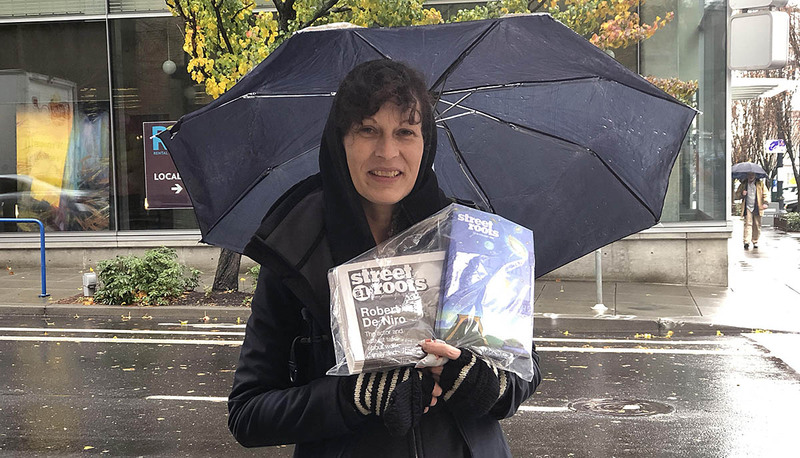 Char sells the 2018 zine, along with the Street Roots newspaper, on Friday, Nov. 23. Her piece “Bridges” is published in the zine. 3. 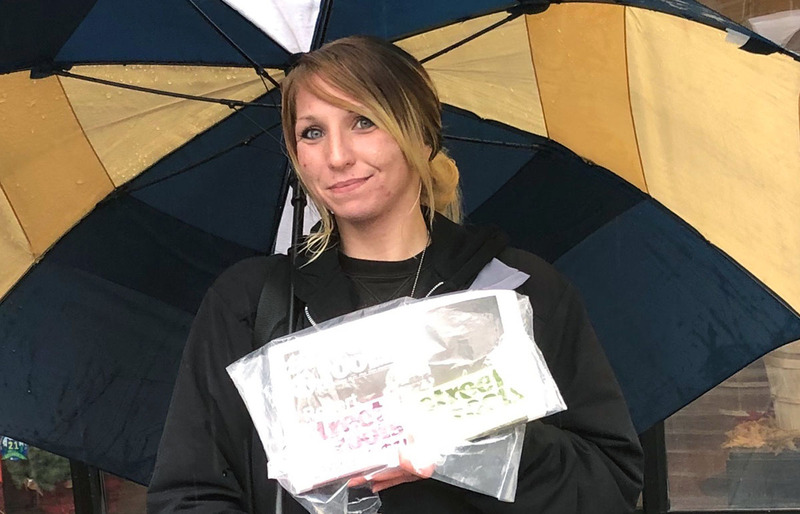 Our vendors brave the cold and the rain, so we could always use supplies for them. Warm hats, socks, gloves and mittens. Ponchos. Hand warmers. Street Roots vendor Aimee Miller. 4. Think of us when you are doing your holiday shopping. Purchase gifts and support us at the same time! 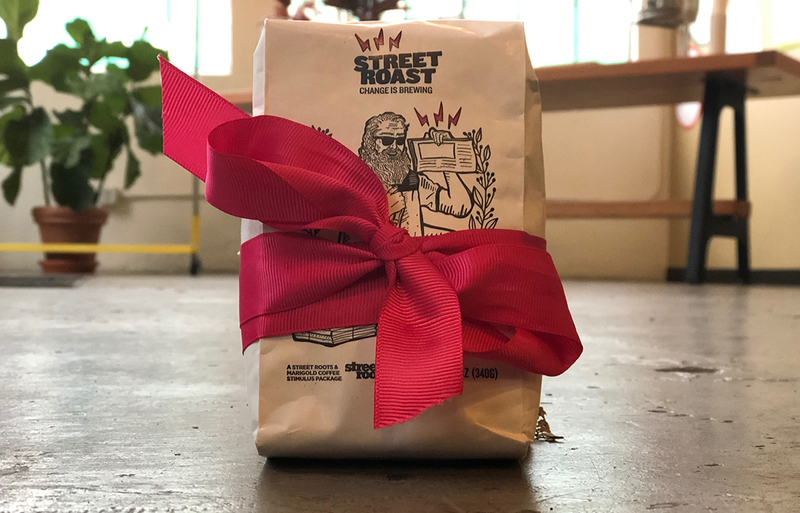 New Seasons is selling gift packages of Street Roast coffee ($3.33 of every pound of Street Roast sold goes directly to Street Roots). Or donate $75 and get a limited edition 20th anniversary beanie. 5. The single biggest way we support our nonprofit is through individual donations. One by one by one, you all keep us afloat. Donate to Street Roots at the Willamette Week Give!Guide or set up a recurring donation on our website, and help us move into our 20th year strong together. And please keep spreading your kindness, encountering each person living unhoused as fully human and deserving of respect and courtesy. Thank you, Street Roots community!